Our family at Flip the Clinic never ceases to amaze me. When we are struggling to find an electrician to answer a question to help a practice with a unique layout, someone stands up and calls their cousin. When we are completely stumped and searching to bring in new voices to tough conversations, a group comes forward saying they want to help. Navigating those stormy moments are the foundation of what makes Flip the Clinic something special and accentuates our ability to reach beyond a Flip design process to something deeper and more meaningful. Something that shifts the DNA of our community to one of service to one another rather than a checklist of IOUs and scorekeeping. Thank you for the enriching experience this puts out into the healthcare world. We’ve had a busy few months and we’re long overdue to catch up you! Here’s a small sneak peek at our latest. We’re wrapping up a six-month effort working with our friends at the Children’s Integrated Center for Success and we have much to share on our experience there – both the inspiring and the challenging moments, like making the tough decision to call for a full-stop on the changemaking efforts! We’ll be sharing those stories, including our decision process and the details you, yourself, may find you relate to in our newsletter and here on our site. We’ve also been on the road quite a bit! As you all know from the post a few weeks ago, we are working on our finishing touches to the Flip the Clinic Playbook. Flooded with ideas, inspiration, and gritty reality checks, the Playbook just went through a 50-person peer review process and we are putting together those ideas to share with everyone in mid September. This morning, I adventured to Phoenix, Arizona for a revisit of one of our first communities at Flip the Clinic, as the guest of the awesome team at the Arizona Health Information Management Association (AzHIMA). I’m always blown away by the eager-to-serve, thoughtful informaticists we have behind the scenes in healthcare. If you aren’t already, connect to your local AHIMA chapters and say hello. I assure you, they are ready for you! Flip the Clinic first visited Arizona about 18 months ago with our second-ever Flip the Clinic Lab. Working together that day, we dug into the frustrations, local dynamics, and desperate creativity of the local community. Members from tech startups in health care, competing health agencies, patients and caregivers, independent clinicians, and even the Maricopa County department of education for arrived, curious to see what Flip the Clinic even was, and explore how it might be used. 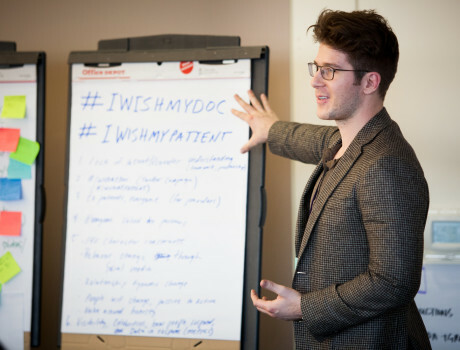 We had an awesome corps of patients and caregivers in the room who explained why ideas would likely fail, offered options to advance new ideas, and voiced their own dreams. Our education friends shared expertise with our health-anchored folks about how humans learn and why information doesn’t always get retained, points that I still reference when I speak about Flip the Clinic. We had a nutritionist create a game to play to encourage health grocery shopping and we had a solo practitioner earnestly ask for guidance crafting a business plan to franchise her practice model. 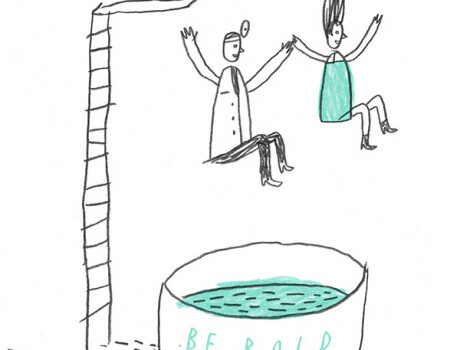 Our legacy work on Flip #19 was resurrected at that meeting and Amanda Greene (@LALupusLady) launched the web campaign #FliptheWait to gather pictures of waiting rooms and should-be waiting room designs from Twitter users across the US. A month later, this effort evolved again to encourage staff at a medical practice to sit in their waiting room for 15 minutes and truly experience the wait. Our friends at LIVESTRONG Foundation did just that, observing their clinic waiting room onsite for 15 minutes and immediately sprung into action to add wi-fi access, clean the walls and furniture, and add soft music. Working together that day, we were surrounded by an incredible Andy Warhol exhibit focused on challenging the framework for how we see the world. We, at Flip the Clinic, then challenged our own framework for Flip the Clinic, and the voices of our community guided our next steps. Our next events were stronger as a result of those changes and we carved a new path forward for our post-even processes and community assessment. 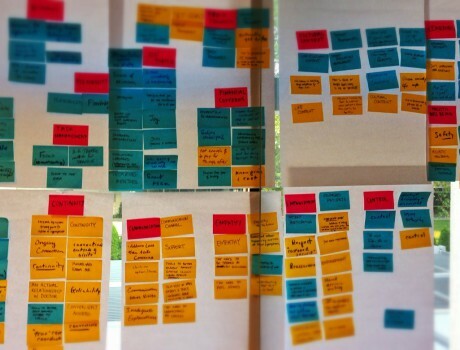 That path eventually became known as the Elements of a Flipped Clinic — our best thinking on what a Flipped Clinic should look like. Evolving a product or idea, or staying nimble when inventing one, requires great humility and creativity among a team and we are always inspired by the graceful urgency of those teams coming together to work with Flip the Clinic. From traveling the country, meeting people where they live and thrive, to one-on-one efforts with patients and clinicians across the country – we’ve been focused on building the things that work and the ways to achieve them. Flip the Clinic was built by its community to craft the answers needed for the current problems being faced in healthcare. Together, we have co-created our interpretation of what “better” means and strengthened our resolve to find the things that work in the system. Today, we are announcing a call to identify a 3-week workgroup to help us advance our latest work on the Hero’s journey through Flip the Clinic, the Flip the Clinic Playbook. This journey was crafted through our last two years of work with communities just like yours – achieving great things and working hard, hoping for a little bit more. 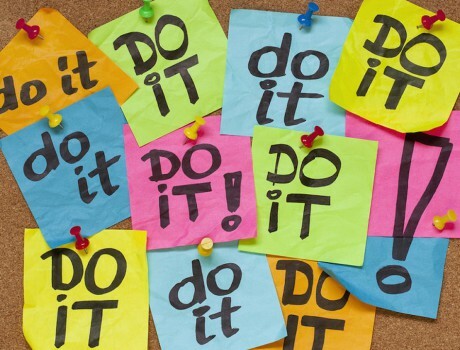 At some point in time, we’ve all found ourselves asking, “what’s in it for me if I step up to take responsibility?” Will we get a promotion, a raise, will our colleagues even notice? For Leanne Thomas, a Behavioral Specialist at the Children’s Integrated Center for Success (CICS), she found that choice – stepping forward to embrace personal responsibility, changes everything. Last Fall, CICS experienced exponential growth in their patient population due to overwhelming need for their services in the Lehigh Valley. As a result, the staff size quickly increased to match this growing demand. Without sufficient policies and procedures in place to manage both the patient population and the needs of new staff, the team at CICS were left feeling out of touch with their patients and frustrated by confusing and, often, conflicting streams of communication. As a team, CICS reached out to Flip the Clinic to find ways to add value for patients, employees, and their community. They wanted Joy and they needed greater Nourishment. Their initial goal focused on co-creating a practice environment that resonates for everyone involved by addressing the human side of health care. However, one core theme continuously bubbled to the surface that needed to be addressed before the team could tackle anything else – the need for all members of the team, no matter their position, to be invested in the future of CICS and act to support that ideal. “Things were a mess,” Leanne offered when we spoke with her about the personal “ah-ha” moment she experienced. She was facing a wave of burnout and felt cautious of offering suggestions for improvements to the culture of CICS. This mindset grew to be overwhelming, and took a toll on her health, as well as her relationships both within CICS and outside the office. Leanne has since found ways to celebrate the achievements, both big and small, of her patients and colleagues at CICS. CICS dedicated a display wall to showcasing these awards – and it has become a fun way of recognizing members of the CICS community for their unique strengths and interests. By assuming responsibility for her part in ensuring the future success of CICS, Leanne found the courage to become a positive force for change – and discovered a renewed sense of joy in her work. 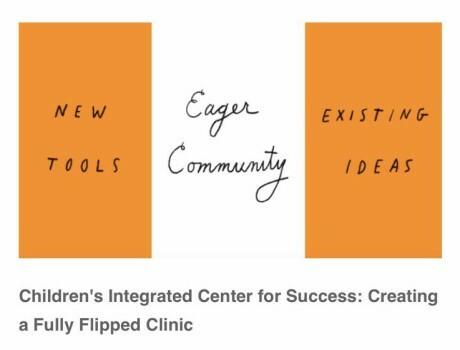 For the last several months, Flip the Clinic has been working with the Children’s Integrated Center for Success (CICS) to truly flip their clinic. CICS team member, Jessica Cuttic, explains what it’s like to roll up her sleeves and incorporate the elements of a Flipped clinic to enhance their service to patients and each other. I am a Licensed Professional Counselor (LPC) in my fifth year of professional practice, specializing in anxiety disorders, depression, and trauma treatment with clients of all ages. The main reason, among many, that I chose to become a counselor is my fascination with growth. Whether it be my own, that of others, or the growth of the plants in my garden, I always want to be an active part of the process. I believe the human capacity for change and healing is infinite, and I approach this work with a collaborative and creative spirit. Like many on our team, I was brought to The Children’s Integrated Center for Success (CICS) by a close friend and colleague who knows me well and felt that I would compliment the integrated approach. While interviewing for my position at CICS, I made it clear that I was searching for a place where I could expand my skillset as a clinician in ways that were creative, connected to my interests, and rooted in best practice. As a graduate student, my research focus was on integrated care models in behavioral health, and from the start it was clear that working in this collaborative, outside-the-box setting was a great fit for me. 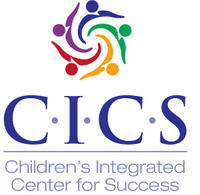 CICS is a warm, welcoming, and energizing agency. A place I felt, from my first interview, would allow me the opportunity to expand myself, my practice, and my impact on our community. As CICS founder, Amy Edgar, walked me to the door at the close of our interview, I held out my hand to her. Instead, she embraced me in a hug. In that moment, I knew I was in the right place. When Flip the Clinic began about a year and a half into my tenure at CICS, I wasn’t exactly sure how I would personally fit into the Flip process, nor was I sure where I would fit the Flip process and activities into my schedule! As a therapist focused mainly on direct clinical care, I was uncertain about what value I could personally add to what seemed like a high-level project. During our launch event, we were guided to identify the elements of the practice we currently have, and envisioned the elements of the practice we hoped to create together. 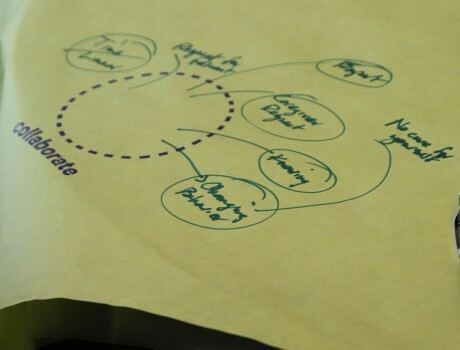 Mixed with the excitement of fresh perspectives and hopes for more adaptive practice processes being born from our Flip the Clinic projects, there were also moments of doubt, frustration, and uncertainty within our team . We sometimes questioned the value of the process, and whether or not the vulnerability and pressure we were experiencing would be worth it in the end. After our Flip the Clinic kick-off meeting, their team left us with a large bag of socks to protect us all at CICS from getting “cold feet” and backing away from this challenge. To this day I appreciate the lighthearted nature and symbolism of that initial gesture. During a more intimate and intense Flip the Clinic session with some core members of our CICS team a few months later, we were offered and encouraged to reach out to Flip the Clinic staff for individual coaching. I reached out to Whitney in the hopes that I could utilize this opportunity to develop as a professional; after all, as I mentioned, growth of all kinds has always been my intention. After processing and exploring in my personal coaching sessions, I found my understanding of our collective work broadening and my own goals crystallizing. I began to recognize that my individual role in creating a Flipped clinic was just as important as my fellow colleagues, and I saw the value in taking ownership of my part in making our clinical community thrive. The opportunity for individual coaching time allowed me to reflect on the stumbling blocks and thorns-in-the-sides that had come up over the past few months, and I began to see those experiences for what they truly were: growing pains. Since I have centered my life, my values, and my work around a love of growth, this was the “a-ha” moment that pushed me to dive deeper into my commitment to this team and this process, even when it is difficult or tiring. How could I expect changing and shifting to be easy and free of those “growing pains”? Along the way, I have felt my capacity and confidence multiply as my voice and vision were heard by the Flip team and then by my own team at CICS. I feel valued and grateful for the support Flip has given me individually, as well as CICS as a whole. As we move toward the final phases of the Flip the Clinic process, I’m in awe of how we have developed as a group. The space we hold for each other is more honest, more vulnerable, and more compassionate. We have met our limits and then soared beyond them together. We have learned to hold one another accountable in a way that still feels supportive and kind. 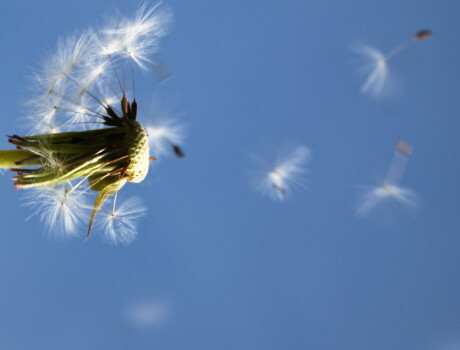 What better example could we set for our clients and families than to live and breathe through our own growing pains and come out the other side? I’m grateful CICS didn’t get cold feet and grateful for the humor and warmth (literal and figurative) provided by those socks, because Flip the Clinic has helped us all step further into the future of CICS. 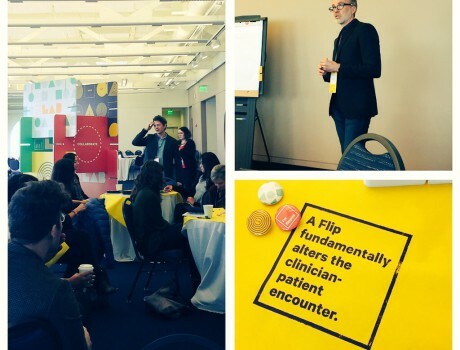 Two years ago, the Flip the Clinic team ventured out to meet with the best and brightest minds, from patients, caregivers, and clinicians to students, executives, and policy-makers, to tackle the pressing issues we all face in our day-to-day health encounters. We traveled to eight different cities, met hundreds of new faces, and collected A LOT of data. 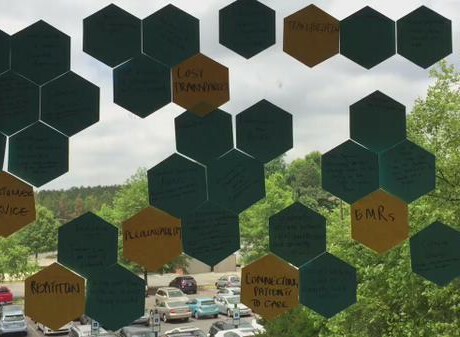 That feedback has provided an excellent window into which processes have and haven’t worked in our community, and led to the creation of the core Elements of Flip the Clinic, our best take on what creates a truly Flipped Clinic. These Elements are People-Centered, Nourishing, Joyful, Transparency, and Expansive. To kick off 2017, we headed to Allentown, Pennsylvania, to partner with our friends at the Children’s Integrated Center for Success (CICS) on a pilot program we’ve dubbed our “Flipped Clinic Sprint.” By applying each of the Elements to real-world experience, our goal is to collaborate with the team at CICS to add value for patients, employees, and the surrounding community by addressing the human side of health care and co-creating a practice environment that resonates for everyone involved. Flipping a clinic launches with a 100-day intensive set of activity, learning journeys, assessment, evaluation, and reality awareness – all while the practice is still seeing patients and providing care! We’re really excited to get started! We will be posting updates, stories, and interesting tid-bits from the field, and we hope you’ll continue to provide the same level of feedback that has proven to be crucial to the evolution and success of Flip the Clinic. We’ll be updating our community here and through our newsletter, make sure to sign up at the bottom of this page. This article was originally published on Enclothed Cognition, the blog from Medelita Scrubs & Lab Coats. 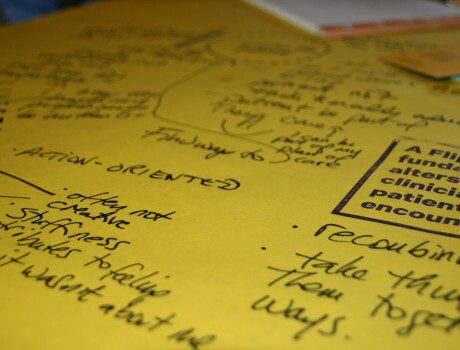 For many organizations, the mission statement serves as a guidepost. It is a set of values that aid in leading decision making, team dynamic, and goal setting for each member of the organization collectively, and as individuals. In Flip the Clinic, we’ve gone a step further. Over the last three years, members of our community – patients, clinicians, and people like you – have provided valuable feedback about the nuts and bolts behind Flip the Clinic. They have been on the ground, getting their hands dirty, and discovering what has and hasn’t worked within their community. Because we not only encourage experimentation, the foundation of Flip the Clinic is built on experience – both successes and missteps along the way. In an effort to synthesize these thoughts and ideas, we archived each bit of feedback we received. Though the healthcare landscape changes frequently, we believe we’ve established deep-rooted and enduring Elements of a Flipped Clinic, the heartbeat we expect to see within our first Flipped Clinics in 2017. 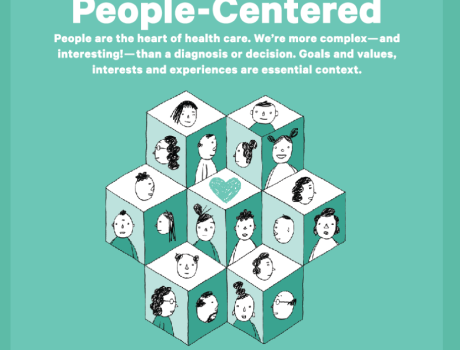 People are the heart of health care—and we’re more complex (and interesting!) than a diagnosis or a decision. Goals and values, interests and experiences are valued. Patients and clinicians feel welcomed and supported both by the clinic’s design and by the entire clinic community. 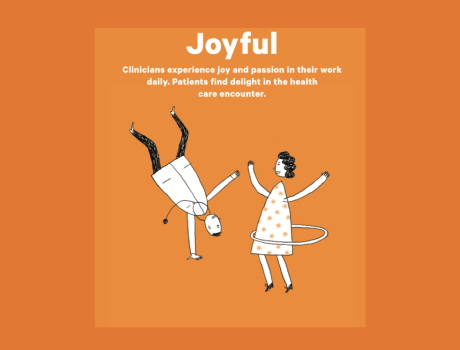 Providers experience joy and passion in their work daily. Patients find delight in the health care encounter. 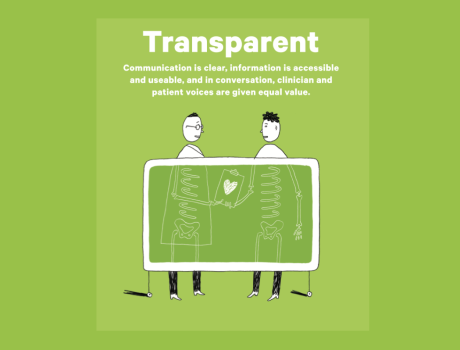 Communication is clear, information is accessible and useable, and in conversation, clinician and patient voices are given equal value. 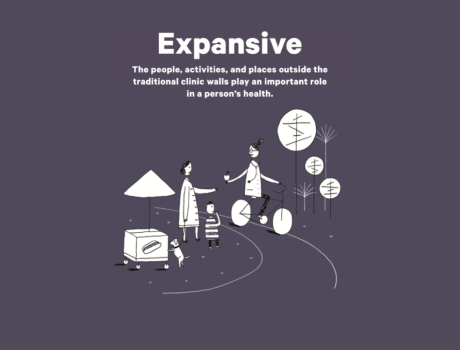 It values the people and places outside the traditional clinic walls that play an important role in a person’s health. Over the next few posts, we will dive into each Element and meet the organizations and people who bring them to life. Which Element resonates most with you? Do you have a personal experience of encountering an Element in action (or a lack of)? Tell us in the comment section! Did you miss our last post with Medelita? Catch up here! For many of us patients, we make our way to the doctor when we need an annual physical or have a seasonal cold. On those rare occasions, we have come to expect that these visits will be short, impersonal, and exhaustive of our time and resources. The clinician-patient encounter is fraught. The standard 15-minute visit has led to many unsatisfactory interactions between patients and clinicians – often leaving patients feeling unheard, disheartened, and frustrated about their inability to fully engage in their personal health plan. Would it be an understatement to call healthcare in the United States an imperfect system? 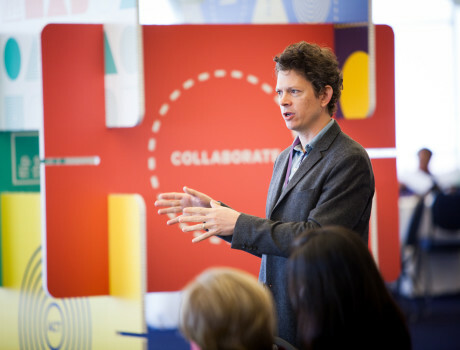 These pinch-points, or challenges, that negatively affect the daily lives of patients and clinicians led to the creation of Flip the Clinic, a project funded by the Robert Wood Johnson Foundation that seeks to dramatically improve medical visits in the United States through a community-driven reimagining of health and health care. The clinician-patient interaction is a powerful part of modern medicine and is at the heart of healthcare, and ought to mean a whole lot more. We’re all vulnerable at different points in our life, and sometimes we are lucky enough to provoke a moment of awesome and inspiration from the depths of our vulnerability to inspire those around and ahead of us. Flip the Clinic had the gift of capturing such a moment this year when we visited our friends in San Francisco at the Southeast Health Center. We’ve featured Dr. Keith Seidel’s Apple Store-inspired, Flip the Clinic contributions both in our Flip #35 and our recent “Flip the Clinic is You” video. His team of patients and clinicians and staff have gone on to produce a “tactical nurse” approach to the morning check-in meetings, they’ve implemented a happiness voting system with patients when they leave the appointment so the team can, in real-time, know what the patient experience is like, and, they’ve come together as a practice to support Keith during the year he faced in 2015. 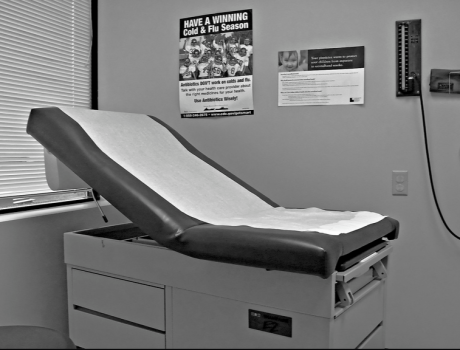 This is the final post in a five-part series focusing on the elements of a Flipped Clinic. 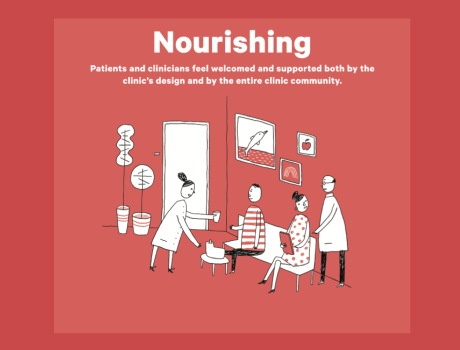 For a bit more background, be sure to check out our first four posts that discuss the Flipped Clinic as people-centered, nourishing, joyful, and transparent. You know that person who swoops in at just the right moment? That one whose suggestion clears the way for a breakthrough? Or who offers a new take on a problem that instantly strengthens the solution? In less than a week, a dozen-or-so teams will be landing in Denver to attend Flip the Clinic’s first ever Summit. From electronic health record interoperability to better transportation for dialysis patients, these groups are gearing up to tackle some very ambitious problems. And they’re ready. Each group is stacked with people who will add expertise and energy to the project. To support them, Flip the Clinic is bringing a set of skilled faculty and facilitators to push the projects further and cheer the teams on. We. Can. Not. Wait. 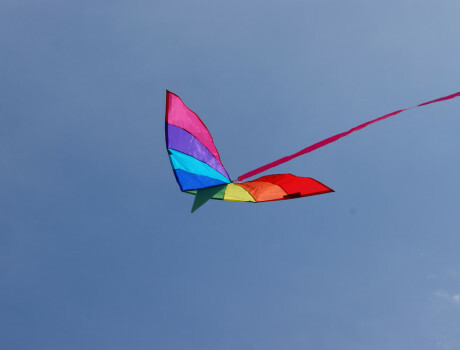 This post is the fourth in a series focusing on the five elements of a Flipped Clinic. For a bit more background, be sure to check out our first three posts that discuss the Flipped Clinic as people-centered, nourishing, and joyful. This post is the third in a series focusing on the five elements of a Flipped Clinic. For a bit more background, be sure to check out our first two posts that discuss the Flipped Clinic as people-centered and nourishing. A Flipped Clinic is one that’s Joyful. This post is the second in a series focusing on the five elements of a Flipped Clinic. To read a bit more about the background, plus our take on the first element, check out our first post here. Flip the Clinic is You! Over the last ten months, Flip the Clinic has visited communities across the country. 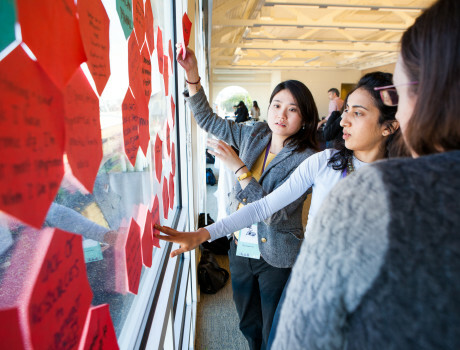 Since our first Lab in San Francisco last January, we’ve had the great pleasure of watching ideas that sprouted during and between those events grow into Flips that have powerfully transformed the clinic, the community, and the connection to our health data. Please join us in celebrating a year of transformative ideas, scrappy pilot programs, and people all over the country standing up —with tremendous might and gumption—to make health and health care a more joyful experience. Flip the Clinic threw three—count ‘em three—events the week of September 7th. 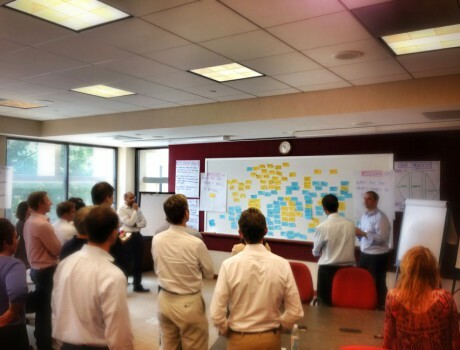 On Tuesday, we brainstormed opportunities for change in New Jersey at the Robert Wood Johnson Foundation. 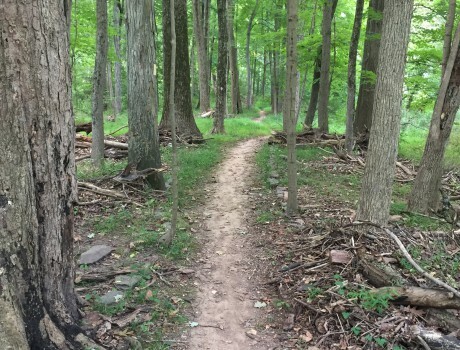 On Wednesday, we held an all-day Lab at with participants at the D&R Greenway Land Trust in Princeton. And on Thursday, we set up shop in the Mütter Museum in Philadelphia. 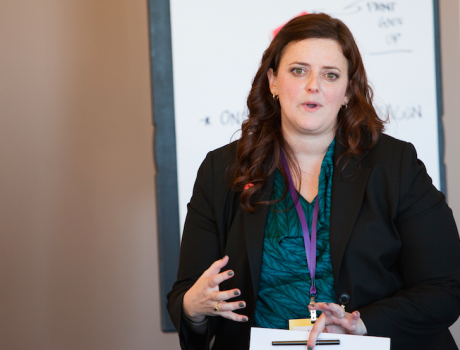 The Robert Wood Johnson Foundation’s Andrea Ducas explains what she expected—and how she was surprised—by attending a Flip the Clinic Lab. I wasn’t quite sure what to expect walking into our Durham Flip the Clinic event. I was anxious to see the kinds of “Flips” the group developed. What would they tell me about health care priorities in the research triangle? What might stand out as something I could dig deeper into or bring back to my colleagues? I was anxious to see who FTC brought to the table, and to walk away with a better understanding of the “secret sauce” behind a program that I’m not in the weeds of day-to-day. And I was also pretty anxious to get over my cold. I’m happy to report that I got a lot more than I bargained for—on all fronts (sorry again for the gift of my germs, Whitney!). I’ll cut to the chase and say I did get some sense of Durham’s health care priorities and it was certainly informative to meet the folks around the table…but it was the answer to my secret sauce question that was most intriguing. Flip the Clinic is all about the community it’s building. I heard more than once, in a town where divisions run deep based on shades of blue, that ‘despite working on X for 15-20 years, this is the first time I’m meeting someone with my counterpoint job from Y health system to try to solve the same problem.’ Another common refrain from the innovators in the room? ‘I thought I was alone in this, but now I see there’s an entire community out there! And I’m so glad I’m in it now!’ The energy around sharing, collaboration, and camaraderie was palpable. I realized at the meeting that the beauty of Flip the Clinic is less about the “Flips” (is that blasphemy?) and more about its capacity to bring like-minded health care disruptors together to problem-solve. 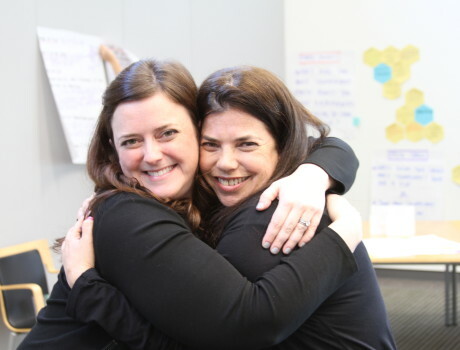 To really lean on and learn from one another in the pursuit of a better clinical experience. 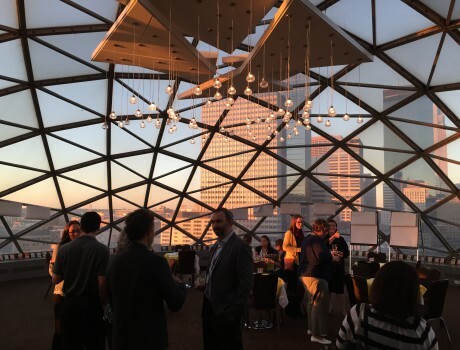 To stop ‘beating the joy out of practice‘ and ‘bring some joy and optimism back into medicine.’ To just ‘do things differently.’ And in the case of some of the in-person convenings we’re hosting, to do so with the great luxury of dedicated time. The Flips proposed were certainly interesting—they touched on topics like payment reform, better data flows, and addressing non-clinical health determinants—but in the end they served mostly as a way to surface shared interest and pinch-points to help clear a path forward. As symbols for what to address to drive toward true culture change in health care. I left genuinely excited to see what’s next for Durham, and the potential for the ideas—but especially collaborative community—sparked there to start something special. Who Supports a Patient’s Right to Access their Health Records? Since the beginning of the summer, more than a dozen organizations have committed their support to Flip 55, which helps patents access their medical records. Together, their commitment has the potential to reach 160 thousand clinicians and 20 million patients. 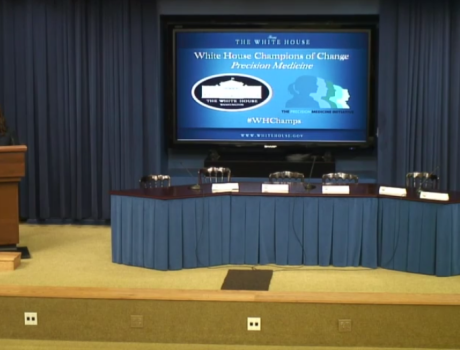 Flip the Clinic’s presentation on stage at the White House’s Champions of Change event? We can credit the invitation to the extraordinary enthusiasm of these diverse organizations. Over the next few weeks, we’ll be checking in with them to see how they’re planning to support patient access to health data. For now, here’s a peek at who’s in and what’s next. LIVESTRONG Foundation Leading the charge is LIVESTRONG, Flip the Clinic’s partner and city host. LIVESTRONG is a non-profit creating a relevant, vibrant cancer movement based on evidence and by investing in strategic solutions. The foundation reached more than 45,000 client interactions in 2014. The organization’s ability to get the word out about accessing health records is remarkable. Epic (Perhaps you’ve heard of the software giant) Epic makes the Electronic Health Record software for mid-size and large medical groups, hospitals and integrated healthcare organizations. Epic works with customers that include community hospitals, academic facilities, children’s organizations, safety net providers and multi-hospital systems. This post was first published on Medium. It is reposted here with permission from its author. As a UX team, our highest duty is to serve the people who will be using our products; people dealing with a stressful day or a stressful diagnosis. The best part of our job is when we actually get to talk to these people. We get a few nurses on the phone, or we go room-to-room visiting patients in hospitals, trying to learn more about their lives and needs. We call this ‘discovery work’, and because of deadlines and other constraints, we don’t get to do it every single day. That’s why we get really excited when we see other people doing inspiring things we can learn from. Last month, the well-known management expert Gary Hamel wrote an article for the Harvard Business Review. In it, he provided a powerful example of how small shifts can bring about powerful change—without depending upon funding, new technology, or an industry-wide revamping. It began with a story of a health system struggling to improve its abysmal patient satisfaction scores. Despite investing in tracking food quality, call light response times, effectiveness of communication with patients, and other reasonable metrics in its hospitals, the network of facilities wasn’t seeing any improvements. Investing more money to improve amenities or to bring on extra staff would have both been logical fixes if the health system had the budget to do it. It didn’t. Last Wednesday, Flip the Clinic’s Whitney Bowman-Zatzkin took the stage at the White House Champions of Change event focused on the President’s Precision Medicine Initiative to share some wonderful news about Flip 55. Fifteen organizations had committed to helping patients get access to their electronic health records. That means Flip 55 has a potential reach 160 thousand clinicians and 20 million patients. It was a wonderful moment for Flip the Clinic, but just the start of some extraordinary things to come. We interviewed Whitney to find out what she learned from the inspiring people and organizations at the event and to hear about what happens after you go the White House. Flip the Clinic Goes to the White House! Flip the Clinic is proud to announce it has been chosen as one of the organizations featured at the White House Champions of Change for Precision Medicine event. Flip the Clinic’s program director Whitney Bowman-Zatzkin will share the news of a transformational idea that has been picked up by over a dozen health systems, organizations, and clinics across the country. 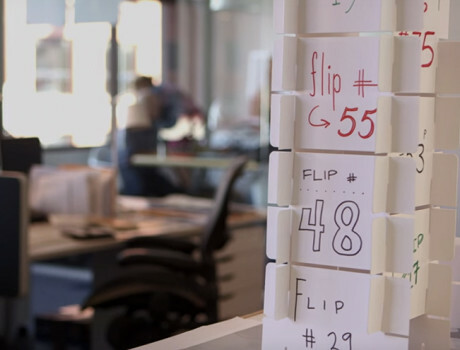 Right now, the solution—what Flip the Clinic calls “Flip 55”—is set to reach 20 million patients and 160 thousand clinicians. And interest is only growing. Urgent Ask: Stand Up for Health Data Access Today. 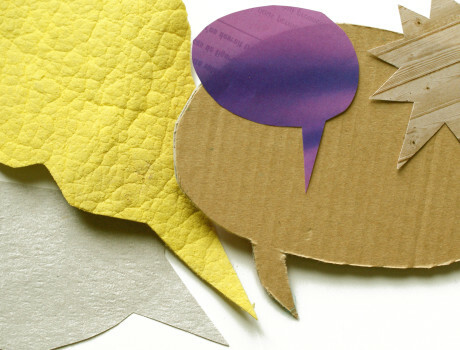 Your Voice Could Have a National Impact. 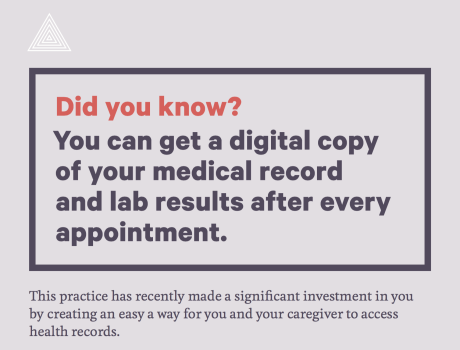 Are YOU at a clinic or hospital system with an active electronic health record? Flip the Clinic is looking for great sites across the US to help pilot Flip #55, our recent Flip created to stimulate greater participation and engagement around digital health records. At any one moment, we operate within a framework that guides our decisions: what is our budget, is it covered by insurance, how the system has always worked. When a patient visits the clinic, it’s understood that time with a clinician is a limited resource. We also carry around a set of pressures that weigh on us: tension with a coworker, the impending tax deadline, and a never ending list of to-dos. All of these inform how we navigate our world; they motivate us to apologize to the colleague and come prepared with three questions to ask our nurse practitioner during an appointment. Meshie Knight is a Program Associate at the Robert Wood Johnson Foundation. December is low season when you run a health clinic. People are traveling or otherwise occupied, which means they’re putting off appointments. 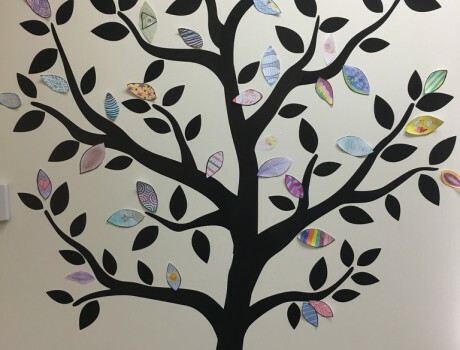 Keith Seidel, the medical director of Southeast Health Center in the Bayview neighborhood of San Francisco, saw the holidays as an opportunity. First, fewer patients meant he could give all the health center’s employees as much time off as they wanted. Second, it would give Seidel the opening to bring his team together and make some changes to his clinic. He’d mobilize everyone working in the clinic—behavioral specialists, nurses, dentists, physicians, data scientists, everyone—to tackle a number of public health challenges facing his patient population. 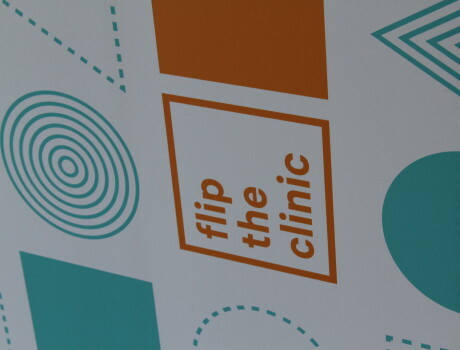 Last Thursday, Flip the Clinic landed in Phoenix for the second of its six Lab events. 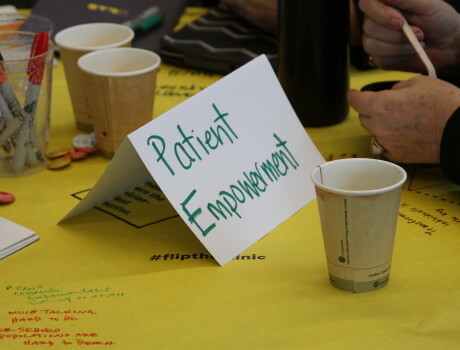 Forty-five or so attendees, including patients, nurses, doctors, pharmacists, physician assistants, nurse practitioners, community organizers, entrepreneurs, and innovation team leaders, gathered in the Phoenix Art Museum to explore ways to improve the patient-clinician encounter. For patients, there are more wearable technologies available than ever. Have a sleep condition? Need a heart monitor? Require help tracking symptoms of a chronic condition? Patients, providers, and researchers have so many devices at their disposal that it’s often tough to figure out which one would be the best match for a specific condition. If you could openly offer any suggestion to your physician, what would it be and why? If you could kindly suggest something that could improve your patient’s time in the clinic or overall health, what would you tell them? I wish our pediatrician emailed a health questionnaire prior to my children’s annual appointments, so I could sit and review the questions with them in advance. My kids would feel more prepared for their appointment and would have more time for questions and dialogue related to their growth and development. Grace O’Sullivan is the Director of Strategic Partnerships at Project HoneyBee – Center for Sustainable Health, ASU. When I heard that Flip the Clinic was hitting the road for a series of regional meetings, I was thrilled. 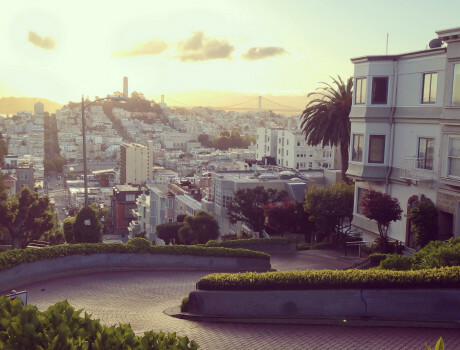 Though my residential address is not technically in the Bay Area, my ethos has a local zip code – so away I went! When we decided to launch a second year of Flip the Clinic, we knew that we’d need to do more than just tend this website. We knew that we’d have to take this idea and ask people to wrestle with it, to see if we could get this notion of changing to the doctor-patient encounter to stick among real challenges and real limitations. In short, we knew that Flip the Clinic would have to get real. In September 2013 – a little more than a year ago – the Robert Wood Johnson Foundation started Flip the Clinic with a conversation. 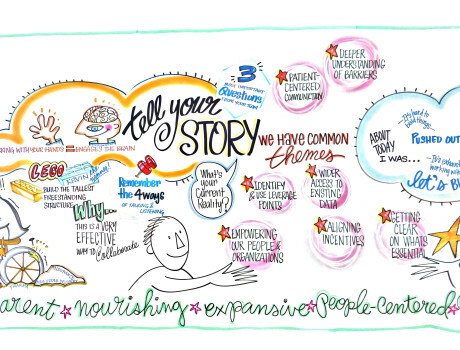 We gathered at RWJF HQ in Princeton, bringing a dozen smart folks from various corners of the health and health care world – including patients – and asked them to how we could do things differently. How could we rethink the routine doctor’s visit to be a more fruitful, more fulfilling part of health care? Steve Downs is chief technology and information officer at the Robert Wood Johnson Foundation. This post originally appeared on KevinMD.com on April 20, 2014. Fifteen minutes. Give or take. That’s about how long a patient typically spends with a primary care doctor during an office visit. If you’re lucky enough to be healthy, maybe that visit comes once every year or two. Or if you’re less healthy, maybe every few months. In either case, it’s not a lot of time. Not a lot of time to share all the relevant developments. Not a lot of time to determine what to make of them. Not a lot of time to set a course going forward. And not a lot of time to absorb it all. It stands to reason that we should figure out how to make the most of this precious 15 minutes. Young Social Innovators “Flip Out” for Health and Health Care in L.A.
Shaheen Mamawala, MPA, is a communications associate at the Robert Wood Johnson Foundation. If you had five hours to engage a dozen young, energetic social innovators on a pressing systemic challenge, how would you do it? I found out when I attended the Los Angeles Social Innovation Scrimmage in March as part of StartingBloc’s Institute for Social Innovation. 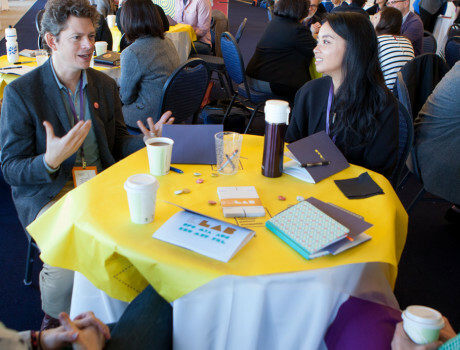 StartingBloc brings together young entrepreneurs and innovators who are working to create change across multiple sectors, connects them to one another, and gives them access to the tools, resources and support needed to create impact. Full disclosure: I was a StartingBloc Fellow in 2011. TED 2014: Flip the Clinic! Michael Painter, JD, MD, is a senior program officer at the Robert Wood Johnson Foundation. This post originally appeared on The Health Care Blog on March 25, 2014. It has been edited to fit this blog. So, what’s with all this flipping business? What’s all this talk about health conversations? 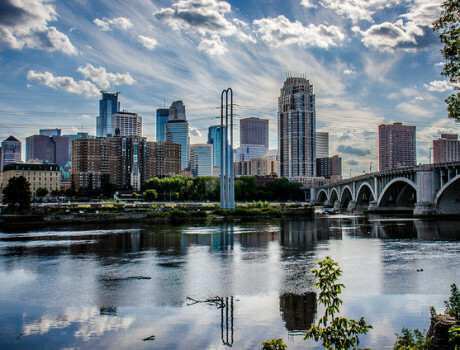 The Robert Wood Johnson Foundation wants to help you and others across the nation determine what your culture of health looks like and then, more importantly, go built it. We’re pretty serious about this culture of health. It’s important, and it’s time. We need all hands on deck, so we’re looking for help in lots of interesting places. 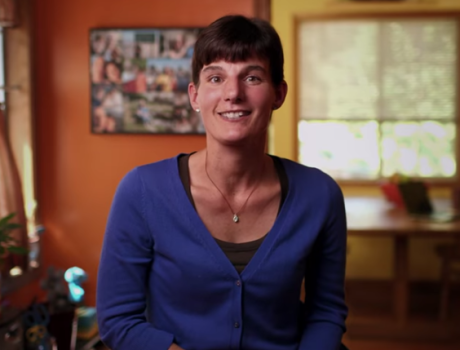 Anne Weiss is a Robert Wood Johnson Foundation senior program officer and team director. 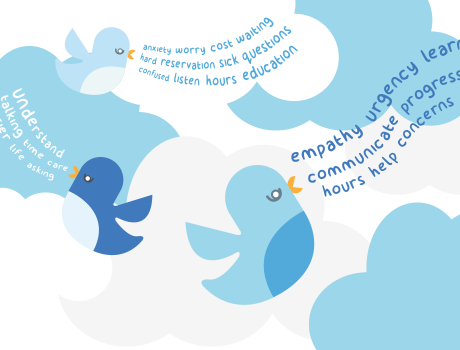 This post originally appeared on RWJF’s Culture of Health blog on March 24, 2014. I’ve worked at the Robert Wood Johnson Foundation for almost 15 years, and it’s still thrilling (and a little intimidating), working with some of the world’s leading experts, thinkers, and innovators, not to mention colleagues who are brilliant, passionate, and kind. While I’ve never admitted this before, as a long-time fan of television medical dramas the people from clinical backgrounds, the “white coats,” especially fascinate me. The doctors, nurses and other health professionals I work with seem part of some mysterious club, survivors of years of arduous training who have the ability to improve peoples’ lives in a way I simply can’t. For months, good ideas have been pouring into our inbox. 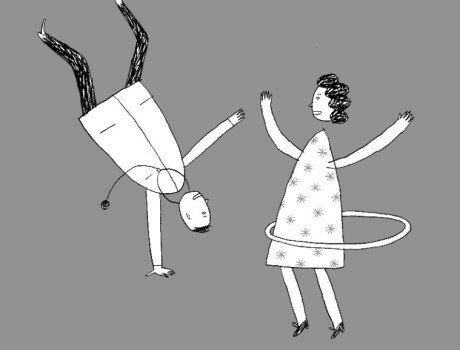 While we’ve been getting ready to reveal our first series of flips, patients, providers, and administrators have been emailing in to offer their own ideas. We learned about particular pain points—what parts of the clinic drive people crazy and what might be done about them. We heard about existing programs and new innovations. 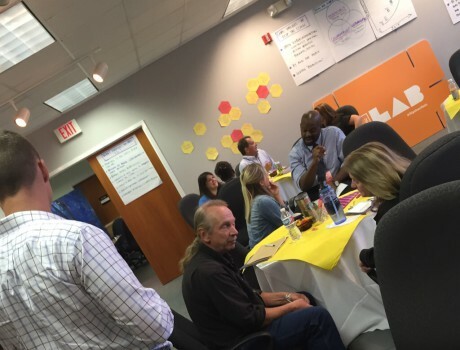 One of the earliest questions during the Flip the Clinic design meeting in September was, Why? Why Flip the Clinic? One participant suggested that patients are often satisfied with their care, but feel like everyone care is lacking. Another pointed out that for both patient and provider the existing system had a huge benefit: inertia. So was there really a reason to suggest change? How do you turn an idea into something bigger? It’s necessary, but not sufficient, to start with a good idea, of course. But it also takes a community of supporters – people willing to step out of their busy day-to-day and contribute time and brainpower to turning that idea into something closer to reality.